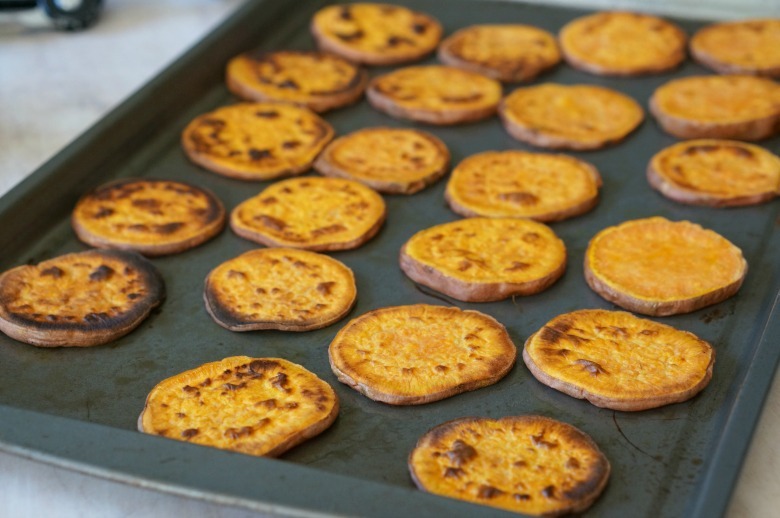 This is recipe for Sweet Potato Crostini is shared as a sponsored post written by me on behalf of DaVinci Wine. All opinions and images are my own. 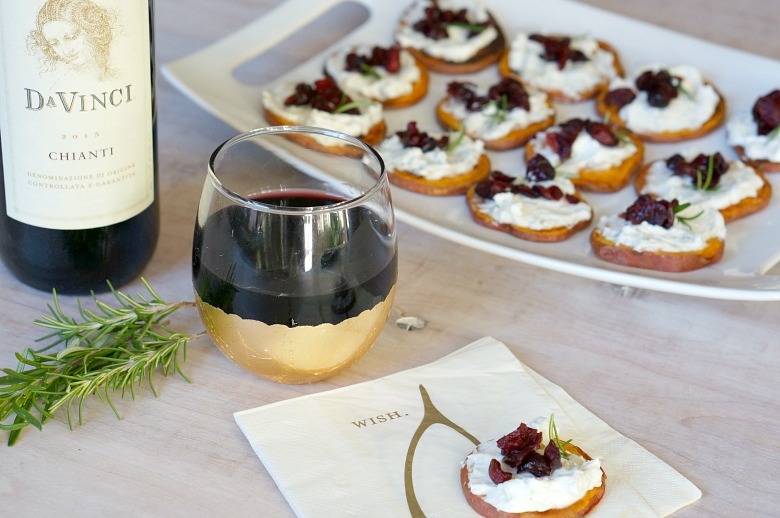 Eat, drink and be merry with this perfect wine and app pairing. Enjoy a glass of Chianti and pass the plate! 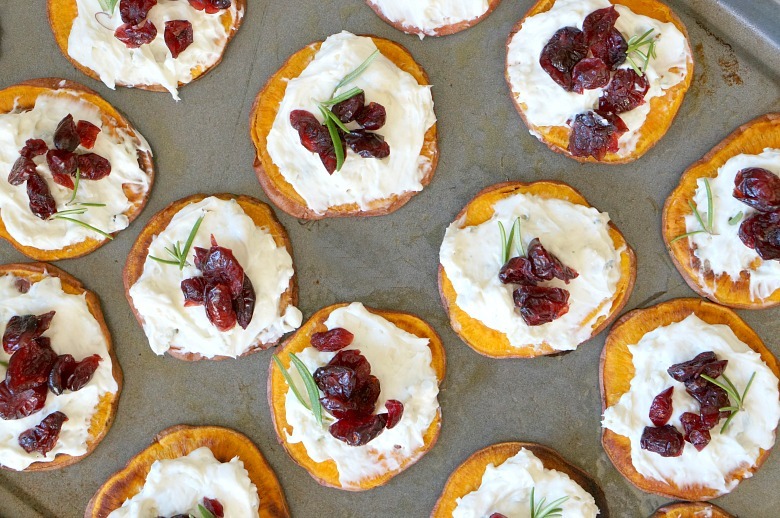 These Sweet Potato Crostini (with blue cheese and cranberries) will get the holiday party started! There are a lot of stress triggers during the holiday season, but one thing that always makes me happy… Entertaining friends and family. If you ask me (and let’s just assume you did), the key to enjoying yourself at your own party? Making sure to not take too much on. All you need are a few easy-to-make yet impressive apps and great wine. With good food and good drink, what’s NOT to be merry about? Rolling hills of Tucany… This is one of those photos I find it hard to believe I was actually there. That view! When planning out the menu, I like to consider fun food and wine pairings. For this recipe, my inspiration started with Chianti. 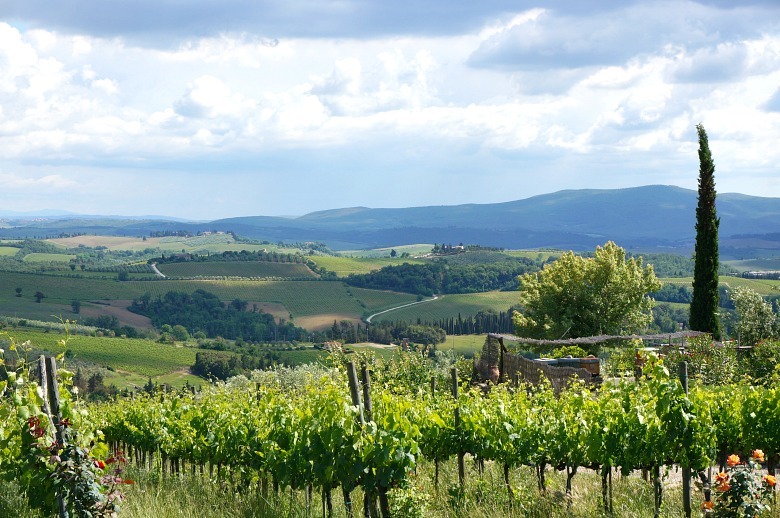 My husband and I spent our 10th anniversary exploring Tuscan wine country and discovering authentic Chianti wines. Man, it’s amazing and beautiful countryside and I have a whole new appreciation for the wines from there, like those from DaVinci wine. DaVinci wines are produced by the Cantine Leonardo da Vinci, a cooperative of more than 200 local winegrowers nestled near the Tuscan hillside town of Vinci, the historic birthplace of Leonardo da Vinci. Their Chianti is a well-balanced wine of medium weight with jammy flavors of ripe plums, cherries and red fruit. 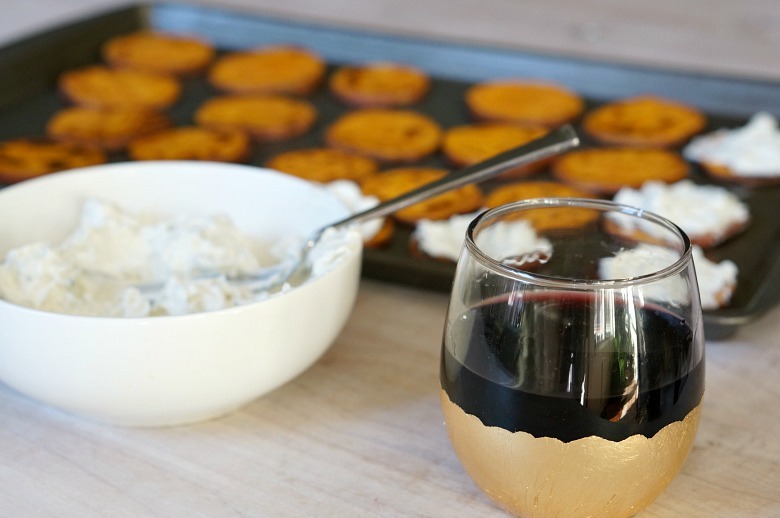 With a deep red color and a peppery finish, this wine can stand up to big flavors, which is what we’re bringing with our recipe for Sweet Potato Crostini with Blue Cheese and Cranberries. 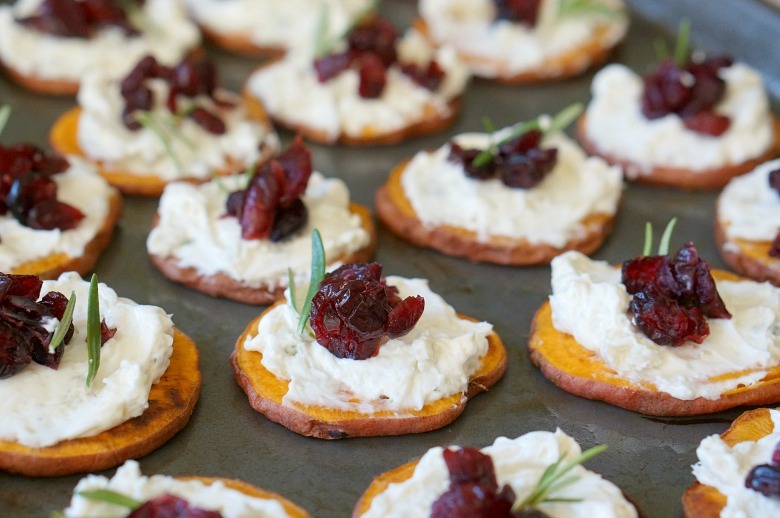 Perfect finger food to pass around at your holiday shindig, your guests will rave about this pairing long after the event! Preheat the oven to 425 degrees Fahrenheit and spray a large baking sheet well with cooking spray. 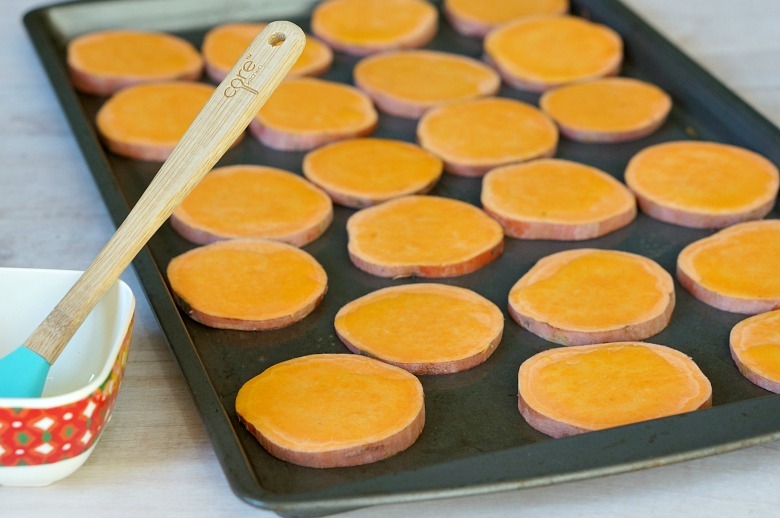 Thinly slice the potatoes, about 1/4″ thick, and place them on the prepared pan. Brush the top of each potato with olive oil and bake 15 minutes. Flip and return to the oven for another 15 minutes, cooked through and crisp. Allow to cool at least 5 minutes. Sprinkle with cranberries and a leaf or two of rosemary. Place on a serving platter, and take a moment to yourself before your guests arrive! You’ve got this! Preheat the oven to 425 degrees Fahrenheit and spray a large baking sheet well with cooking spray. Thinly slice the potatoes, about 1/4" thick, and place them on the prepared pan. Brush the top of each potato with olive oil and bake 15 minutes. Mix together the whipped cream cheese and blue cheese until well combined. Using a butter knife, spread a tablespoon or two onto each potato slice. Sprinkle with cranberries and a leaf or two of rosemary. Place on a serving platter, and take a moment to yourself before your guests arrive! Need a few other menu suggestions? This recipe for Sundried Tomato Hummus is always a crowd pleaser. 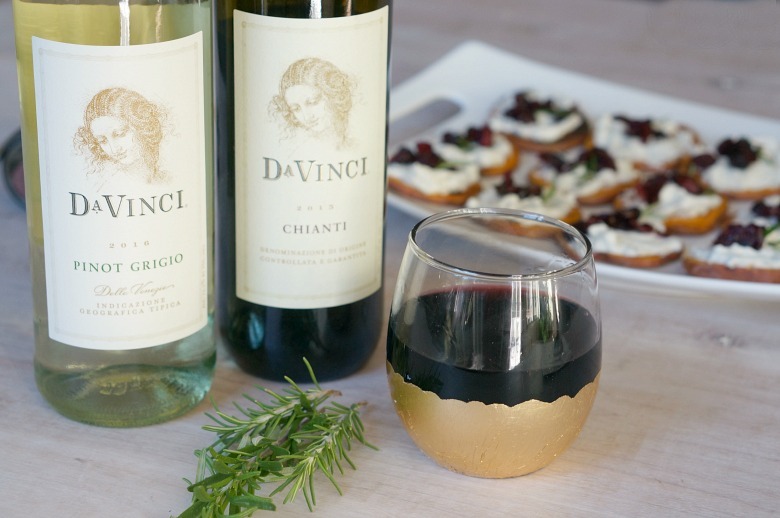 Serve it with fresh-cut veggies and pair it with the DaVinci Pinot Grigio! Or, check out this post which shares three different crostini preparations. They’d be perfect with DaVinci Chianti and the Pinot Grigio wines! This is a sponsored post written by me on behalf of DaVinci Wine.